Irrigation pump requirements are influenced by the type and scope of the system to be installed. Gathering some basic information from the irrigation plan is essential when selecting the correct pump for the application. Specific site requirements may also influence pump selection. If the site has a limited window when watering can occur, the pumping system must be sized to deliver all of the water required during that window. A pump that is undersized will prevent the system from meeting the total irrigation requirements during the hottest periods. Required operating pressure. Irrigation systems are designed to deliver the correct amount of water to maintain plant vigor. Different types of irrigation equipment are specified to deliver water to plantings of different types. Each type of equipment will have different required operating pressures. Gather the operating pressure requirements from the irrigation plan, noting the required maximum pressure. System flow. It is important to understand the scope of the system. Typically, irrigation is divided into zones, essentially different sections of plant material that are watered at different times. The maximum and minimum flow requirements of different zones of irrigation equipment will impact the size and type of pump. Gather the maximum flow requirement of the largest zone from the irrigation plan. Friction losses. Calculate the total head loss and elevation change from the outlet of the pump to the highest sprinkler head, as well as the suction lift head requirements. These are added to the pressure requirement of the sprinkler devices in sizing the total head the pump must generate. These calculations will yield the system’s hydraulic requirements to properly size the pump. Budget. The design of an irrigation system, as well as the site characteristics, can have dramatic ramifications for the cost of the pump. If an irrigation system designer is not familiar with pumps, they may specify pipe sizing, pump location or watering time requirements that dictate certain pump styles to achieve the required performance. When budget is a concern, there may be opportunities for a pump specialist to recommend changes to make an irrigation system more efficient. The available power supply is always an important factor to consider and may also impact the cost of the pump. Compare the long-term cost of using the available power versus a new electric service. For some installations, an additional circuit or power connection will need to be run to accommodate a large irrigation pump. There are two main actions that a pump performs in an irrigation application: pressure boost or suction lift. The four styles of pumps that are typically used for these applications are horizontal centrifugal, submersible, vertical turbines and vertical multistage pumps. Each style lends itself to some applications better than others. Booster pumps are used to increase (boost) the water pressure in the system. 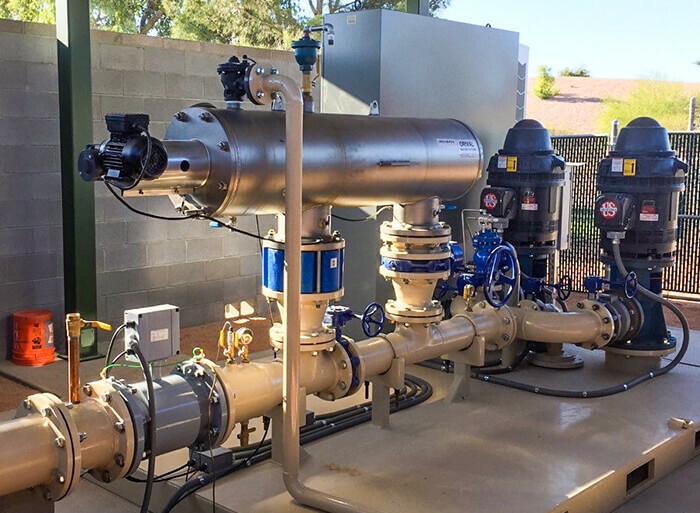 A booster pump may be required when pushing water from above ground, municipal or a reclaimed water source if the primary pump does not provide enough pressure. Primarily, booster pumps are used on domestic or municipal water systems when the existing pressure is not adequate for the irrigation system. This is why it is important to know the system’s required pressure. The two most widely used are horizontal centrifugal and vertical multistage. The selection of the pump depends on three factors: how much pressure is required to run the system, what type of efficiency must be reached, and the type of water—municipal, reclaimed water or gravity supply tanks. Vertical multistage pumps are designed to handle clean water that is free from large solids and debris. Vertical multistage pumps lend themselves to higher pressures, whereas horizontal centrifugal pumps lend themselves to a lower maximum pressure range but are generally more forgiving when handling dirty water. Submersibles and vertical turbines can also be used for boost applications, with special considerations. Vertical turbine pumps use a T-head or booster can—this allows incoming water entering through the suction side to be pulled down into the can, where the impellers are stacked and then boosted out of the discharge side. Because they must be located in the water, both vertical turbines and submersibles can only boost water from a tank or a water source that is located higher than the pump, boosting the gravity derived pressure. For this reason, in most irrigation boost purposes, vertical turbines and submersibles would generally only be used in boost applications if the end user specifically requests them. Horizontal centrifugal pumps and vertical turbines can handle dirty water as long as a screen is present. The screen is important because without it, the irrigation system can get plugged up. Submersibles and vertical multistage pumps are recommended for boosting clean water. Solids or debris can damage these without the use of components such as filters.